"For believe me the secret to realizing the greatest fruitfulness and the greatest enjoyment of existence is: to live dangerously. Build your cities on the slopes of Vesuvius! Send your ships out into uncharted seas! Live in conflict with your equals and with yourselves! Be robbers and ravagers as long as you cannot be rulers and owners, you men of knowledge!" The above is one of the most widely known quotes from Neitzsche’s Thus Spoke Zarathustra, the bulk of which he finished by the end of 1883. The book itself is also the culmination of his philosophy work and therefore his most definitive statement. I picked it to illustrate what stage of the journey we, as listeners, occupy at this juncture on Uncharted. Stinson himself when asked if we can learn from ancient mystics himself said, "Yes! Work together, love each other and slow down. Look at your life deeper. You might not like what you see so change it. We move too fast and cannot see warning signs. We do not mind paying the heavy prices of consequences of our actions until we can't pay no more. Take chances." Certainly the latter part of this quote is telling us to live dangerously and to 'roll with the punches of life' and the 'consequences', (both titles from L.I.F.E. by the way) so I think he would be in accordance with how I'm interpreting this. 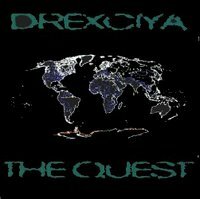 To recap on the preceding The Return of Drexciya, we now know we are being expected to trust them to guide us the rest of the way. But this trust will have to be blind for us and what’s more they have intimated that there are dangers ahead. Personally I think these dangers simply represent the unknown, a word we are already familiar with. In this context it’s just life, the trust is in our own future. Certainly we will all encounter difficulties in our lives, the seriousness of which depends on how we deal with them at the time. Are we the type of person who makes a mountain out of a molehill or allows a spiral of bad things to happen one after another or can we keep a clear head and systematically improve our situation or more importantly pre-empt problems as much as possible? Now if you read the above quote again I think it’s obvious that Neitzsche felt we should live dangerously but if we are smart don’t we learn from these experiences? That is the process in which I believe Drexciya are asking us to partake in. Live dangerously yes, try everything but learn in the process, become the rulers and owners on your own terms, you men of knowledge. I’m not saying that Drexciya were aware of this quote, in fact it’s highly unlikely to be the direct source for the inspiration of this release but I believe it best illustrates what they mean and shows an inspiring continuation of this primal thought which itself no doubt has precursors long before Neitzsche. The actual record itself came out sometime in 1997 on S.I.D. or Somewhere in Detroit. This was the name of the appointment only in house record shop at the UR building. The label was an offshoot of UR which was only available to buy at the store itself. A nice idea but in practise only records 1-5, (Drexciya was 5) actually received no outside distribution. I know not one but three people that visited this store, on two separate trips, not to mention both parties getting to hang out with Mad Mike and whatever other Detroit luminaries that happened by over the course of their stays they all scored as many of the S.I.D.’s that were available at the time. Of course you don’t have to travel all that way to get to hear these track as ‘Hi-Tide’ appears on The Quest and ‘Dr. Blowfin’s Experiment’ was helpfully included on Rolando’s ‘The Aztec Mystic Mix’ on UR (you should be also able to find them on YouTube) I guess it could be said ‘Hi-Tide’ is a bit Neptune’s Lair-ish. Here there is also a 15 second intro of ambient ocean/wave sounds which appear again throughout the track. This intro is not on the version found on 'The Quest'. It has been said that Ultradyne collaborated with Drexciya on 'Dr. Blowfins Experiment' and this may well be true, it would tie in time-wise with their first release, the 'E-Coli' EP on Warp, so maybe this was from that session. The track is by far the best and totally off the hook, it really rockets along and sounds very unlike Drexciya. It's almost 6 minutes long with a short untitled track at the end of this side as well. Well worth tracking down if you can. Title wise ‘Hi-Tide’ seems to indicate we are at a point where we can go no further. Of course the sea goes back out at hi-tide but I don’t believe we have that option here. So maybe in this context Drexciya are saying once we reach Hi Tide, the end of our life, we will know we have reached the end point of this section of our journey. This is obvious in one way but still needs to be stated I suppose, we never stop learning till the very end, this experience is a life sentence. Which brings us in line with the possible meaning of ‘Dr. Blowfin’s Experiment’ which might be how they envision this process, as an experiment carried out by this character which I believe might turn out to be an alter ego of Drexciya themselves. Dr Blowfin will appear again at another crucial point, the beginning of the Storm series on ‘Dr. Blowfin’s Black Storm Stabilising Center’ and there it could be argued appears to be the orchestrator of what is being unleashed. There’s not a lot more to be deciphered from this 12”, I’m sure some people are surprised I even found what I did. What we have learned is that this uncharted territory is not located in as unfamiliar a place as we expected but the events that transpire there are seas uncharted to us where the unknown lurks in the fog. In short it is our very life, our journey, our own quest. A commonality between the last three Gerald Donald solo projects was the listing of sources for further research on our part. Because the topics he is now dealing with are so large and specific and this will probably continue. So if you never got round to tapping in those addresses for yourselves or following up on those sources, here for your convenience are those links. The two websites listed here in relation to sleeve images are both related to the same research company, Deutsches Elektronen-Synchrotron. Their published work must have been a major source of information/inspiration for Donald at this time. Their websites helpfully have an English language option so you can read through their plenteous researches in particle physics, synchrotron radiation and accelerators. Sounding more like another Donald alias, Anton Zeilinger is a professor of the Institute of Experimental Physics of the University of Vienna, Austria. Simply credited on the sleeve for providing images, there’s little doubt that Donald is not unfamiliar with his work. I tracked down his own quite populously presented webpages which contain a selection of his papers and magazine articles. A brief respite, for me, from our Drexciyan trajectory. 'Uncharted' is near.